Shoot stunning architecture in Austin. Are you searching for the best places to take pictures in Austin, Texas? You don't have to look very far to snap frame worthy shots in one of the most picturesque cities in the United States. Austin is home to bountiful natural beauty, stunning architectural wonders and a rich history that photographs phenomenally well. Austin is the capital of Texas. With nearly a million residents calling it home, the charming southwestern community ranks as the fourth-largest growing city in the state. The city's booming metropolitan area is tempered with spectacular naturalism, including sparkling lakes and expansive ridges. The combination of modern amenities and breathtaking natural beauty makes Austin one of the most popular places in Texas to photograph. Austin is not a place you want to visit without your camera. The city was settled on the banks of the Colorado River by pioneers in the 1830s and has since blossomed into a high-tech haven, a center for government and education, and a major player in the business industry. 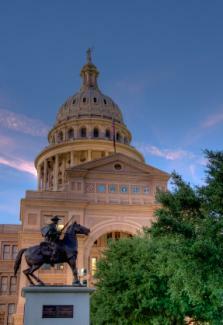 The State Capitol complex in Austin sits on 46 acres of immaculately landscaped property. The grounds are bordered by stately shade trees and gloriously colorful flowering gardens. The capitol itself is a stunning piece of architecture. 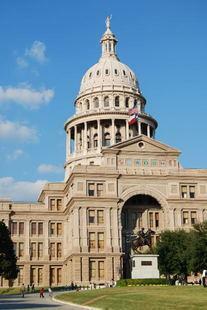 The classic statehouse is made of famous Texas pink granite and dominates the city skyline. The handsome structure photographs well from all angles and can also be documented at night thanks to the high wattage lights that illuminate it after sunset. 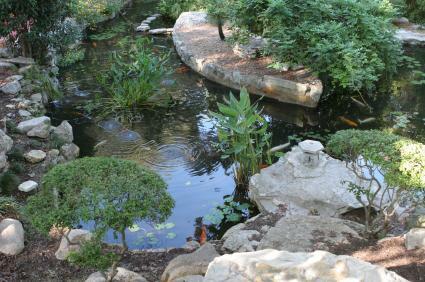 Zilker Park and Nature Preserve is located just outside the city and features miles of awe-inspiring scenery. Don't miss photographing the Taniguchi Oriental Garden, which houses exquisite floral and fauna. 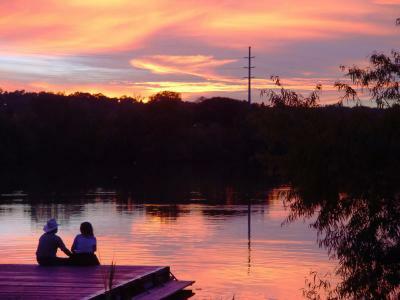 Close by is Lou Neff Point, where Barton Creek flows into the Colorado River. This scenic spot is a fabulous place to shoot downtown Austin and capture the river flowing through town. The opposite shore provides dozens of other amazing photo opportunities, including the city's famous lighted Christmas tree that calls Zilker Park home during the holiday season. The Zilker Nature Preserve features miles of trails and overlooks that are a photographer's dream. The natural paths and stunning overlooks provide sweeping views of the park and preserve, which features a variety of wildflowers, towering tress and quaint bridges. The lakes offer recreational opportunities, such as swimming, boating, and hiking. In addition, the unique composition of the landscape surrounding the lakes is something many photographers can appreciate. The area blends natural rural beauty, such as such amazing aquatic reserves, basins and waterfalls with some urban touches, such as golf courses and huge mansions that dot the lake hillsides and shorelines. The French Legation is the only building in Texas erected by a foreign government. The historic structure is among the best places to take pictures in Austin because of its central location, which provides superb views of the downtown area. The grounds and carriage house of the French Legation is open to the public Tuesday through Sunday. Admission is free, though there is a charge for guided tours through the historic home and reconstructed kitchen structures. However, the price is worth it, considering the access you are given to document unprecedented pieces of Texas history, such as antique furniture, remarkable architecture and one-of-kind décor. City Park Road is a mainstay in Austin. It provides magnificent views of the downtown area, as well as glimpses of expansive Hill Country. The road ends at Emma Long Metropolitan Park on the banks of Lake Austin, a spot that offers dozens of resplendent natural photo opportunities.